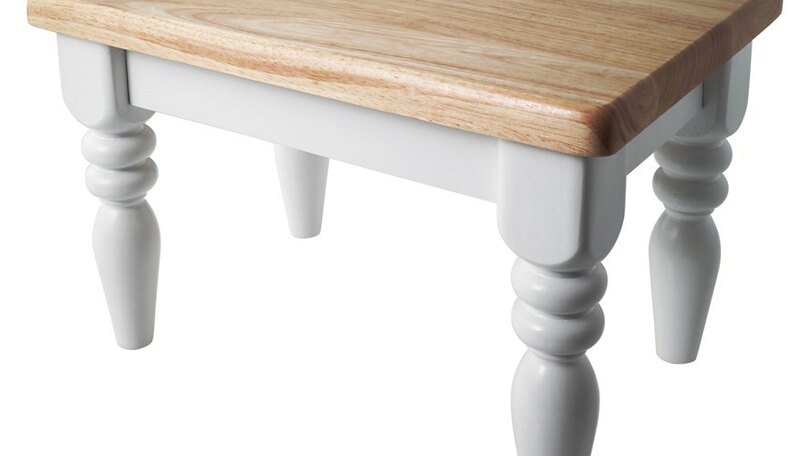 Tabletops made of fine hardwood or wood assemblies such as butcher block are set upon a frame that holds the legs. These natural wood tabletops expand and contract due to changes in the moisture of the air between summer and winter. The method of attaching tabletops to the frames should always allow for these seasonal adjustments. The design of the table dictates the most advantageous places to secure a tabletop to allow for seasonal expansion and contraction. Spread a carpet or soft bedspread out on a large enough part of the floor to hold the table. Lay the natural wood tabletop tabletop on the floor with the top facing down. Place the base frame on over the underside of the top. Lay the frame down with its leg attachments facing up. Secure a tabletop with a large rectangular design that overhangs on all sides to the base frame at two points in the center of both short sides. Secure a half round table at three points along the straight end, and secure a small table with a drawer at three points along the end where the drawer opens. Put an L-bracket at each securing point. Screw the brackets to the frames with wood screws and a screwdriver before attaching tabletops. Center the frame on the underside of the tabletop and secure the L-brackets to the tabletop. Attach the legs to the base frame and stand the table upright. Reach under the tabletop and grip the frame to move the table.